The waterproofing experts at Baird Foundation Repair can install a crawl space waterproofing system that addresses all your needs. We make it easy to repair your wet crawl space by providing a free inspection and estimate. As Greater San Antonio & South Texas' trusted waterproofing contractor, we serve Corpus Christi, Laredo, San Antonio and the surrounding area. 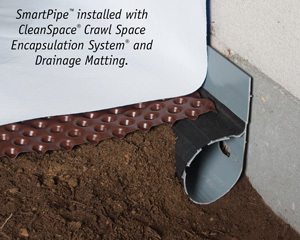 The patented SmartPipe™ drainage system is designed for installation against crawl space walls. Thanks to its unique profile and integral filter fabric protection, SmartPipe™ will never clog or fail to capture wall and floor seepage. This perimeter drainage system is connected to a crawl space sump pump that automatically pumps collected water outside your house. 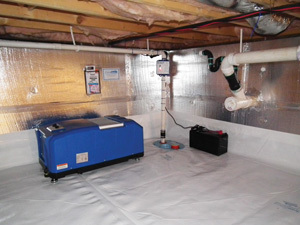 For best protection, install a CleanSpace sump pump system with battery backup. This protection ensures that your waterproofing system will keep working even when the power goes out. Interested in our crawl space waterproofing or crawl space repair services? Contact Baird Foundation Repair today for a Free Estimate, offered to customers in San Antonio, Laredo, Corpus Christi, Floresville, Universal City, Schertz, Canyon Lake, Converse, Boerne and nearby Texas. Give us a call at 1-210-405-2194 or contact us online.